I am so over trying to arrange a ski date after 40 years of skiing. Occasionally one phone call is worth the effort to catch up with a friend for a bluebird ski day or to have a companion in braving a snowstorm. But, more and more, I am very content skiing alone. In my social 20s, skiing was a party, meeting friends and family for a day on the hill and a long lunch in the spring sunshine on a mountain restaurant deck or a packback potluck at a trailside picnic table.Even in those days the 10-minute rule was de rigueur: No one waited longer at the appointed meeting place before we were took off down the next run or boarded the lift.There were also several years of skiing with small children, my legs seemingly in a permanent snowplow (the term with my offspring) or a pizza wedge (the term with my grandchildren). We sang our “chairlift songs” to ease the poky rides on a bitterly cold day (those tunes are engraved on the memories of my middle-age son and daughter). But now I enjoy the solitude of my own thoughts, my choice of what run to take, not being teased into skiing Corkscrew or Aztec, shamelessly selecting only apple dumpling with whipped cream for lunch at Bonnie’s, and quitting after two hours on the hill if I feel like it. What I really enjoy is not waiting around.On crowded days, skiing alone ensures speedy boarding of the Silver Queen Gondola and Ajax Mountain Express, and a kind word from the lifties.If I were with a ski buddy, I doubt I would have had the delightful conversation in the gondola with two young South Africans who were riding their last ride to the Sundeck to say goodbye to their co-workers after three months of working and skiing in Aspen. With a friend on the chairlift, I probably would not have talked with the 80-something Texan who spends every winter in Aspen and skis (usually alone!) 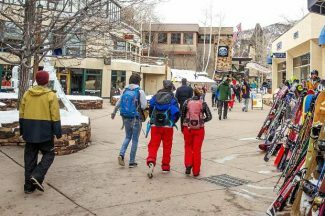 every day of the ski season.Maybe it’s an age thing – preferring your own company.